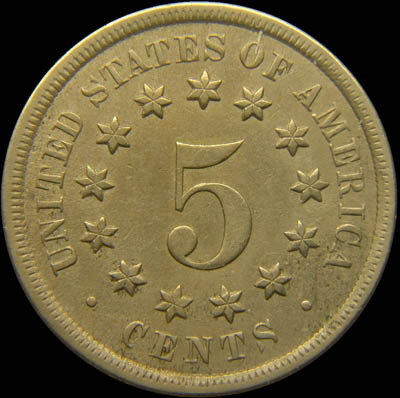 1868 shield nickels occur with both the reverse of 1867 (IIa) and the reverse of 1868 (IIb). 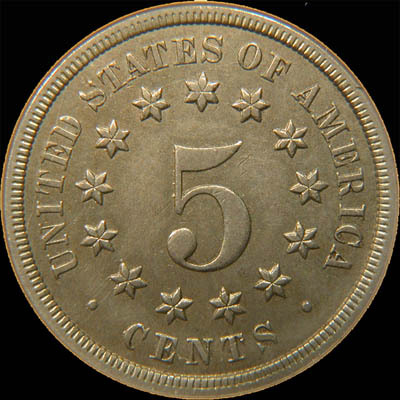 The reverse of 1868 was only used in 1868. 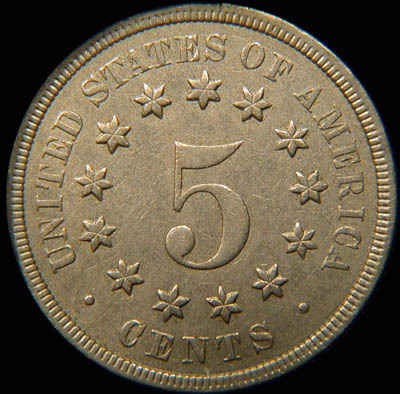 The reverse of 1868 exhibits a different placement of the reverse stars, which point to the midpoint of A (STATES), left foot of M (AMERICA), and to the midpoint of R (AMERICA). 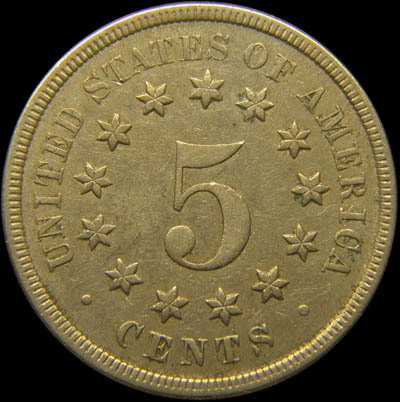 Varieties of the 1868 hub are differentiated by letters which broke off the master hub in sequence as the hub was used. The sequence for breaking is C (CENTS) S (CENTS) S (first S in STATES) D (UNITED). Here we have the "no broken letters" variety, probably the toughest of the five hub stages to find. It's important to note that ALL 1868 with reverse of 1867 show no broken letters, so make sure you have a reverse of 1868 before considering the hub varieties documented on this page. 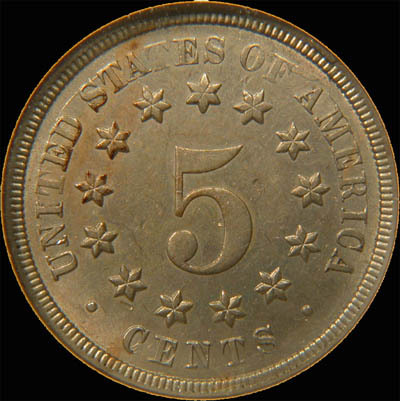 In addition to the five hub varieties shown on this webpage, there are also transitional varieties showing partially broken letters within the C/S/S/D sequence. The first letter to break is the C in CENTS. This stage shows both a broken C and a broken S in cents. This stage shows three broken letters. In addition to the prior broken letters in CENTS, now the first S in STATES is broken. The final hub stage shows four broken letters. In addition to the previous three, now the D in UNITED is broken. The reverse of 1868 varieties were first researched and thoroughly documented by Dennis Paulsen. This page copyright (C) 2012, 2015 by Howard Spindel. All rights reserved.